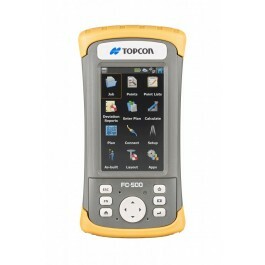 The Topcon FC-500 field controller is designed for the construction, mapping and survey professional and is ideal for MAGNET® Field or Pocket 3D software solutions, getting the most out of all Topcon GNSS receivers and optical total stations. The FC-500 has an optional 3.5G cellular modem to instantly connect to MAGNET Enterprise and Sitelink3D™ secure services for sending and receiving data files from active jobsites. With a capacitive touchscreen, similar to many of the smartphones used every day, the display surface is also extremely scratch-resistant and much more pierce resistant to sharp objects compared with displays in other products. With the FC-500’s internal “intelligent” batteries, there is no worry of ever overcharging. Typical battery life is tested to up to 20 hours with excellent performance under extreme conditions. Recharging is fast and achives a 50 percent charge in as little as an hour. The FC-500’s external ports are located at the base of the unit: USB Host, USB client micro, power, and audio. The USB Host A is used in the field to quickly copy a large job, coordinate or DXF file to the FC-500. The DB9 serial port is perfect for older total stations that still require a cable. The FC-500 features a 4.3 in. display designed for viewing in direct sunlight. The display uses a one-touch interface that is optically bonded to increase visibility. With a single key touch, the user can change the orientation of the screen from portrait to landscape to increase visibility when viewing maps or 3D drawings. In addition to IP68 certification, which protects against dust and allows the unit to be waterproof up to one meter, the FC-500 is independently certified to MIL-STD 810G standard, and can operate in temperatures from -30ºC to 60ºC. Windows Mobile® 6.5 operating system provides a modern operating environment and added expandability with other software applications. The 1 GHz processor drives any Topcon field application software with ease. A 5 MP auto focus camera with LED flash comes as standard equipment. Quickly aim and capture unlimited photos to then associate within either MAGNET Field or Pocket 3D software. These informative photo notes are available “downstream” for office staff and managers. The optional internal cellular modem instantly enables a direct connection to or from your active project site. Connect to either MAGNET Enterprise or Sitelink3D services for complete and customized project management.